The moon in Sagittarius favors changes in the career, at work, in relations with colleagues and business partners, helps to achieve recognition and social success. The moon in Sagittarius tells a person a passionate, inspired nature. Lunar Sagittarius is always a man of action, interesting to him, many seek him as a strong and enterprising person. This is understandable, given that he is an excellent connoisseur of human nature. But the lunar Sagittarius in the negative - with poor upbringing, in depression - shows quite different, far less pleasant qualities. Can be irritable, restless, constantly dissatisfied, critical, changeable. He is able to put everything upside down, to see in others a bad attitude to his own person. In this state, the lunar Sagittarius is prone to self-deception and lives in a world of illusions. As a result, he can not find harmony in his own soul, becomes fussy and spineless. Starts wasting money. However, in the positive, the lunar Sagittarius is a much more attractive picture. Note that, since by nature they are natureful and optimistic, confident and cheerful, their ugly faces are extremely rare. Yes, and others about such shortcomings do not know: they see a friendly person who is able to help in a difficult life situation. Very often lunar Sagittarius is a psychotherapist for his loved ones. In addition, he is able to give good advice, to suggest how to find a way out of critical circumstances. Since he himself is an optimist, he is able to communicate this quality to others. Lunar Sagittarius willingly share his excess of strength, especially since they really have more than enough. Aspirations . Lunar Sagittarius is a person who is always very few. His goal, as Vysotsky sang, was to find out "there is a limit there on the edge of the earth, and whether it is possible to push the horizons". When he strives for something, personal success for him becomes one of the ways to improve life around him. For example, if Sagittarius is attuned to welfare, then it definitely plans how to use a large part of the funds for good deeds. In a word, the desire to help others in this person is expressed very clearly. Work . In work, the lunar Sagittarius seeks large-scale projects. Inventive, resourceful, charismatic, ambitious, straightforward, intelligent. A born leader. Talented in art, especially in literature and linguistics, in all professions related to speech. And the lunar Sagittarius will be successful on the roads; it will suit the work associated with business trips, travel. By the way, this is one of his passions. 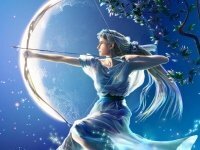 A person with the Moon in Sagittarius is a versatile personality, always keeping pace with the times, keeping an eye on all changes in society. He loves change, never sits in place, hates stagnation and monotony. His principles preach aggressively and sometimes aggressively, he is inclined to impose his opinion. But he does it for the goodness of his soul, for the good of his neighbor. If he thinks that someone is wrong, he will certainly tell him about it to protect him from mistakes. This behavior annoys many, but it must be remembered that it is dictated exclusively by good intentions. In no event can you tell lunar Sagittarius that he is bored with his advice: by this you will inflict a deep spiritual wound on him. And if you want something from him to achieve, do not even try to pressure him and even more to shout: he will not move from his place. But a good word with him you can do anything. Lunar Sagittarius is very susceptible to affection, and against a warm request can not resist. When Sagittarius has decided something, nothing can stop it: one can be sure that he will reach his goal. Therefore, he does not tolerate when they begin to explain that his idea is unrealizable: what does it matter to someone's opinions, when he has the main argument - the knowledge that he can do anything? And it is born to him not from scratch. It's just that many people, when fantasies come to mind, continue to think of them as unrealizable dreams. And the lunar Sagittarius will fantasize and start creating a plan out of a dream. Therefore, he so often achieves the goal. Relationships . To the honor of the lunar Sagittarius, it should be said that with all the craving for change, his emotional attachments are constant. This is not a traitor, he piously honors the word of honor and a sense of duty. He knows how to cheat, but does not like to do it, is able to intrigue, but prefers to act openly. In a romantic relationship is passionate, feels deep feelings. He needs a worthy partner, but also likes to be admired by him. Do not forgive neglect, can not be the second violin. Sagittarius is very responsible. The idealist tends to exaggerate the merits of his second half and sincerely believe it. Generous, loves to make gifts and various surprises. Romantic. He hates enforced attitude, is very independent, can not stand when he is told what to do. The Lunar Sagittarius wants to have a person next to him who he would be proud of. When he falls in love, he does not hesitate to show his feelings neither to the object of love, nor to other people. With pride he demonstrates to the public his chosen one, knows how to create stunning advertising for him and give sky-high recommendations. In this case, the lunar Sagittarius is very hot-tempered. It is able to start with a half-turn. But even though it instantly ignites, it also cools down quickly. Such storms are short-lived, they do not need a lot of time to calm down. Coping with depression for lunar Sagittarius is much more difficult than with anger: very often it is a person with shattered nerves. He should avoid unnecessary nervous tension and stress on the psyche. The procedures and operations on the respiratory system will go well. It is recommended to massage hands, shoulders. Do not perform any procedures and operations on the circulatory system, thighs, liver. Today, these bodies are particularly vulnerable. Not the best time for marriage. Favorable for purchases of imported consumer goods, incl. badges; for the purchase of horses and other large animals, as well as serious and rare literature. With the Moon in Sagittarius imagination is played out, all thoughts tend to break out of the habitual circle of life, and we often go out of town or visit new places. For someone it's a horse ride, and for someone, the market is on the other side of the city. Accordingly, and purchases with gifts differ originality. It can be stylish glasses, super-fashionable shoes, and for a friend / friend an unexpectedly fancy handbag or a purse, an orange tie or something more populous is chosen. The right time for buying tourist stays and weekend tours, as well as goods and accessories for recreation, sports and tourism. The moon is visiting a solid Jupiter. If you want to update your workplace, do it now. For example, if you buy a weekly journal at this stage, you'll find that it's easier to plan your working hours. And, giving your loved one a pen now bought, you will soon hear that she was happy for him. Buy cosmetics, but clothes and shoes are not worth it - the taste can change you. Magic rituals concerning education, long journeys and searching for truth. Do magic, aimed at luck, on long trips and getting protection during such trips. Magic at this time can contribute to a variety of occupations and teachings. Also time is ideal for improving friendly contacts. Focus on good deeds for the benefit of peace and humanity. When the Moon in Sagittarius is a good time for anti-cellulite procedures. Even if a massage against cellulite you will perform at home improvised means, it will still give an excellent result. For a similar massage, it is best to use coffee scrubs or scrubs from sea salt, honey, chocolate masks, masks based on red pepper, essential oils, these masks are easy to make by yourself. Surgical interventions in the hip are contraindicated. In general, on such days it is recommended to use only natural cosmetics. You can try to make the most cosmetic mask, for example, from egg yolks, honey and cognac.